Ball State University Epsilon Mu Chapter Fall 2014 THE IRIS CAMPAIGN Brotherhood. Shelter. Future. IT'S TIME TO REFLECT What does the fraternity mean to you? Something? Anything? Aren't you who you are today at least in part because of Delta Tau Delta Fraternity? Your career? Your spouse? Your memories? I believe in Delta Tau Delta, its traditions and ideals. That's why I'm writing you today. I'm asking you to honor your past and extend a helping hand to the future generations of Delt brothers. IT'S TIME TO COMMIT We engaged in Campaign 50 more than two years ago. As we continue with our plans for financing and construction, we are facing a very real need to increase our dollars raised so we can safely begin construction. Our goal is to raise $1 million in signed pledges by January 31, 2015. If we do not reach this goal we will be forced to delay construction, perhaps indefinitely. It is essential that we have these resources in place and a strong level of commitment from the brotherhood for the project to continue as planned. JOIN US FOR TELEFORUM CALL DECEMBER 2 We will host a special, live teleforum event on December 2, at 6 p.m. EST, to give an update on our deadline and the project schedule, and we would like all alumni to join the call. You will have the opportunity to hear from me and the campaign board and will be able to ask live questions about the campaign. To dial-in on the night of the call, dial (877) 229-8493 and enter PIN 110378. We will send further information and an online registration form via e-mail later this month. IT'S TIME TO MAKE YOUR PLEDGE We are also asking those of you who have yet to make a commitment to pull out that pen and send in your pledge form or visit http://epsilonmu. kintera.org/campaign50 to make a gift online today. We have more than $800,000 pledged to the campaign, but more is needed! This project can only move forward if the necessary equity is secured. Now is the time. With your help we can surpass our goal of $1,175,000! Your name will be permanently placed on the donor plaque with a minimum contribution of $2,500; that's only $42 per month over five years! The high point of this project is set to start next year. This is truly a momentous time for our chapter. Be a part of it! It's time! 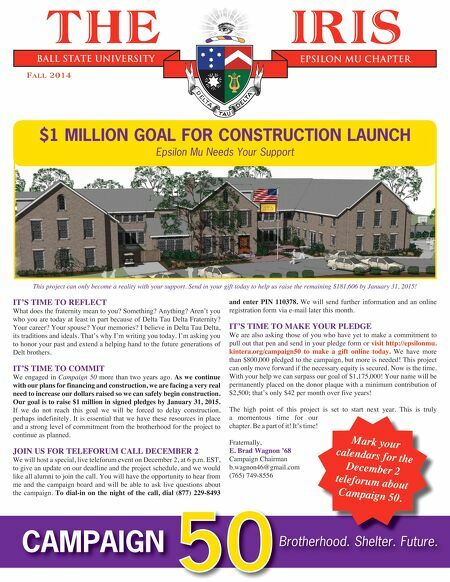 Fraternally, E. Brad Wagnon '68 Campaign Chairman b.wagnon46@gmail.com (765) 749-8556 $1 MILLION GOAL FOR CONSTRUCTION LAUNCH Epsilon Mu Needs Your Support Mark your calendars for the December 2 teleforum about Campaign 50. This project can only become a reality with your support. Send in your gift today to help us raise the remaining $181,606 by January 31, 2015!